Jubilee Teddy Bear is 12 1/2 inches tall, made of the finest blonde mohair, and holds a felt elephant in his paw. It all began with the little elephant... In 1880, Margarete Steiff ran a dress-making business in Giengen,Germany. Originally intended as a pin cushion, the little elephant formed the foundation of her company, "Elephants with colorful saddles" became a major part of her line. 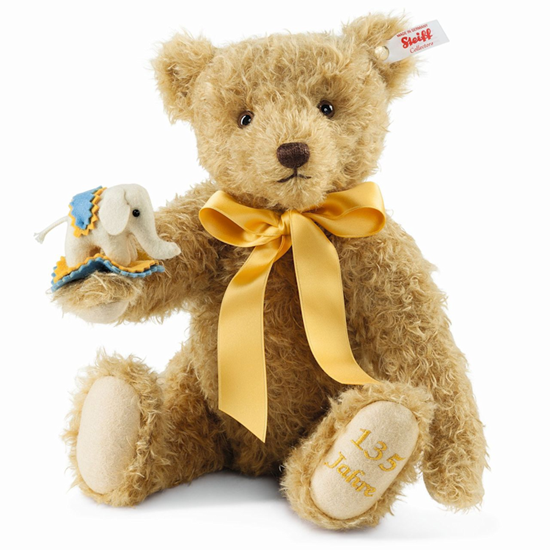 What else should Steiff’s anniversary Teddy bear present for this special Jubilee year? He is proud of his elephant with a colorful saddle. At 12 ½ inches tall, 5-way jointed, and dressed in the finest golden blond mohair, Jubilee’s Teddy Bear’s left paw pad is embroidered with "135 years". The brown of his hand-stitched nose is also reflected in the color of his eyes. The golden colored satin bow around his neck rounds off the image of this classic: also symbolic of a big year, he is a limited worldwide edition of 1,880. He is indeed a historically important addition to anyone´s collection.